The evolution of our best selling 500 series helmet, the All new exo-t510 will teach you to not judge a book by its cover. 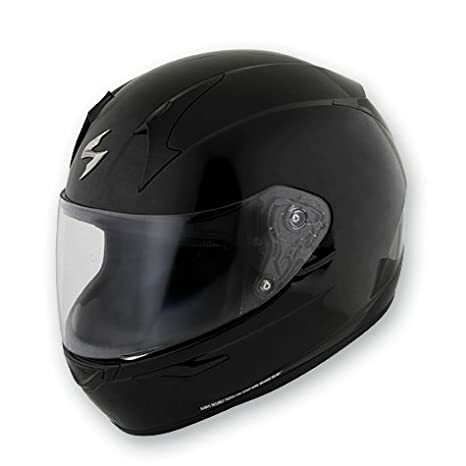 Standard features include the KwikWick II liner for moisture management and comfort; Air Fit cheek pad system for a snug custom fit, Ever Clear Speed View drop down sun visor for bright sunlight riding, and Aero-Tuned ventilation with 4 intake vents and 1 Mega exhaust vent for maximum breathability to keep you cool. The exo-t510 sets new industry standards for technology, features and style. The right helmet for everyone from the daily commuter to the seasoned touring traveler, the exo-t510 is the best all-around helmet at the right price. You no longer need to choose between features and style, now you can have both. Clear Face shield included, dark smoke and other Face shield options sold separately. PINLOCK MaxVision flat shields with tear off posts are also available as an accessory for the track. 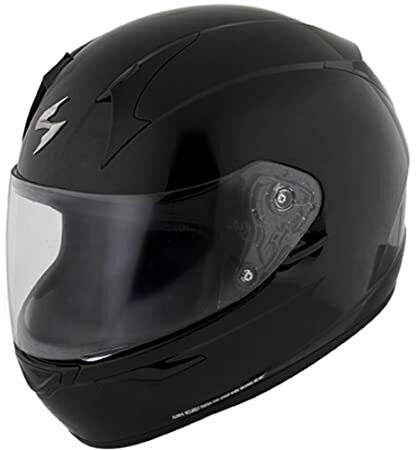 The EXO-R410 sets a new standard for Scorpion’s full face street helmets. An advanced LG Polycarbonate shell results in an ultralight weight Snell-approved helmet at a very competitive price point. Features in common with Scorpion’s top of the line helmets include the Ellipse ratchet system for one Handed positive closure of the eye port, easy shield removal without tools, ever Clear No-Fog face shield for increased vision in extreme cold and damp environmental conditions, KwikWick II liner for moisture management and comfort, an aero tuned ventilation system to help keep your head dry and cool, and the unprecedented integration of our quick release cheek pad system. The EXO-R410 is our best selling, true high performance helmet at an unbeatable value. Clear face shield included, dark smoke and other face shield options sold separately. PINLOCK MaxVision flat shields with tear off posts are also available as an accessory for the track. 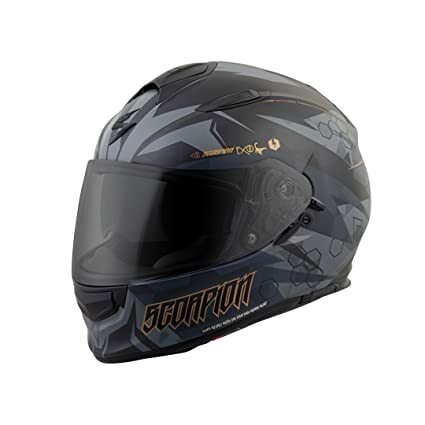 The EXO-R410 sets a new standard for Scorpion’s full face street helmets. An advanced Large Polycarbonate shell results in an ultralight weight Snell-approved helmet at a very competitive price point. Features in common with Scorpion’s top of the line helmets include the Ellipse ratchet system for one Handed positive closure of the eye port, easy shield removal without tools, ever Clear No-Fog face shield for increased vision in extreme cold and damp environmental conditions, KwikWick II liner for moisture management and comfort, an aero tuned ventilation system to help keep your head dry and cool, and the unprecedented integration of our quick release cheek pad system. The EXO-R410 is our best selling, true high performance helmet at an unbeatable value. Clear face shield included, dark smoke and other face shield options sold separately. PINLOCK MaxVision flat shields with tear off posts are also available as an accessory for the track. 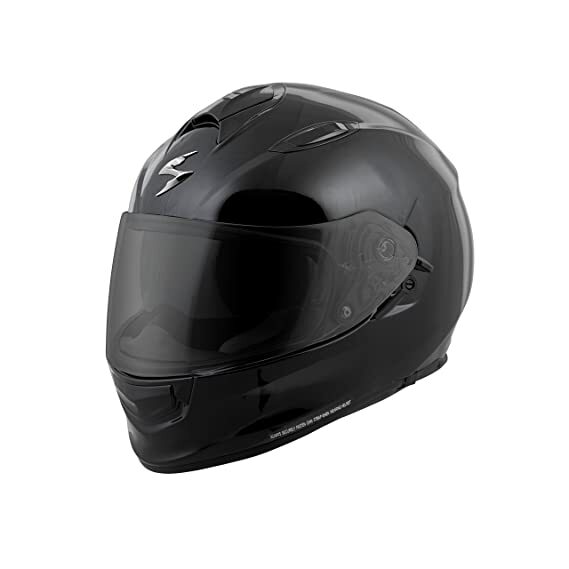 The EXO-R410 sets a new standard for ScorpionExo’s full face street helmets. An advanced LG polycarbonate shell results in an ultralight weight SNELL-approved helmet at a very competitive price point. Features in common with Scorpion’s top of the line helmets include the Ellip-Tec ratchet system for one handed positive closure of the eye port, easy shield removal without tools, Ever Clear No-Fog face shield for increased vision in extreme cold and damp environmental conditions, KwikWick II liner for moisture management and comfort, an aero tuned ventilation system to help keep your head dry and cool, and the unprecedented integration of our Quick Release Cheek Pad System. The EXO-R410 is our best selling, true high performance helmet at an unbeatable value. Clear face shield included, dark smoke and other face shield options sold separately. Inlock MaxVision flat shields with tear off posts are also available as an accessory for the track. 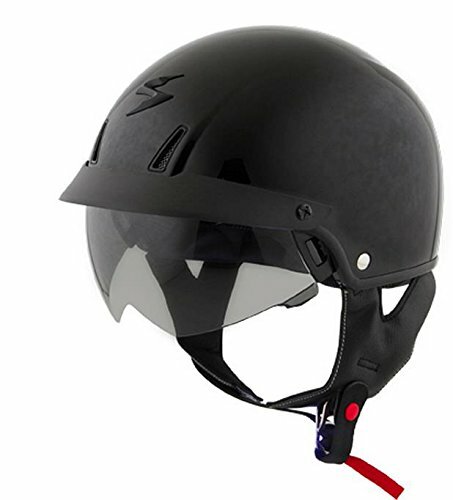 The exo-c110 is Scorpion’s ‘S next-generation take on the classic half helmet. Combining subtle modern lines with an advanced ventilation system the exo-c110 not only looks cool, but it cools the head during long rides. 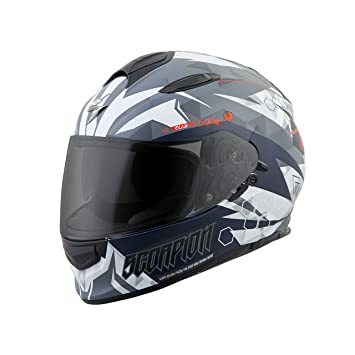 A dual-density EPS liner that extends down to protect the lower rear skull and an improved Speed View sun visor mechanism provides premium touches while maintaining the classic half helmet look and fit, while a unique chin strap retention design prevents it from rolling forward off of your head. Equipped with dark smoke drop-down Sun-Visor and peak visor included. All other options sold separately.